IRVINE, CA – Fewer than five percent of attorneys receive the Super Lawyers recognition, and this year, all six Berger Kahn principals plus three partners have been selected to the Southern California Super Lawyers list, a rating service of outstanding lawyers who have attained a high-degree of peer recognition and professional achievement. 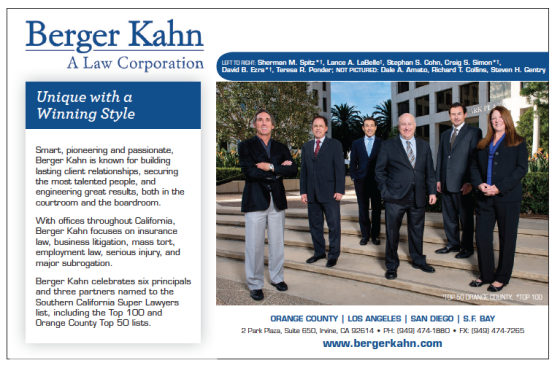 “We have a phenomenal group of attorneys at Berger Kahn and I am very proud to see all six shareholders – who have all practiced together at Berger Kahn for over 20 years – named to the Southern California Super Lawyers list,” says Craig Simon, Managing Partner of Berger Kahn. “To have three of us selected to the ‘Southern California Top 100’ list, and four of us in the ‘Orange County Top 50’ for 2015 is special indeed,” Simon added. · Partners Dale Amato and Steven Gentry are recognized to the list of Super Lawyers for the second year, and Partner Richard Collins is newly added to the list for 2015.